Three days ago, I got a call from a girl named Lily (now I'm wondering if that's her real name) saying she needed to come buy some Girlfriends' accessories. (Have you visited the Shop Now tab at the top of the blog? Please bear with us, our online sales will soon be in full swing *kisses*) Being a mobile shop for now, I offered her two options so she could decide which was more convenient for her - She could come meet me or I could come meet her. Most customers prefer me coming to them, so you can imagine that I was slightly and pleasantly surprised when she opted to come meet me. Great! All that was left was to agree on a day and time and we did. Due to minor changes in both our schedules, she finally showed up yesterday morning being Tuesday ...bearing a large red box all done up with red lace and ribbons. At first, I was puzzled - Is this the Lily I'm supposed to meet? Have I walked up to the wrong person? So I decided to introduce myself and ask who she is. As I was trying to get out the words, the babe was purposefully pushing the box towards me and smiling. Ah! I looked around but there was no one else, which could only mean she was talking to me. 'I'm Lily, this is for you' she said, and promptly thrust the box into my arms. 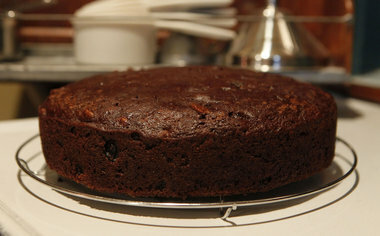 Meanwhile, a yummy chocolate fruit cake was included in the gift box. I had me a slice of that baby for dinner last night. It was glorious! Other things in the box include - bottles of fine wine, chocolates, scented oils and candles, some lovely bath products, a nice picture frame and some cool breakfast-type things etc. Quite the total package. If you're interested in sending out such cute gift boxes, look no further. 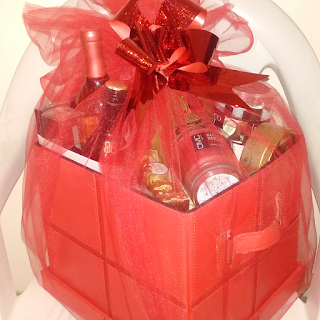 Contact the Red Ribbon Luxury Hampers team on redribbonng@gmail.com or call 08062478261 and thank me later.